Les Grappes helps you to find the most beautiful wine tourism visits. 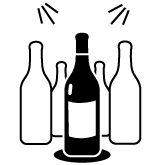 get the wines of your favourite winegrowers delivered to you. Everything you always wanted to know about wine but never dared to ask. 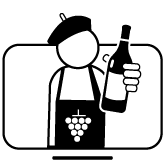 Les Grappes Oenotourisme : Book your next Oenology Weekend online to meet our winegrowers who harvest the grapes. Wine tourism is a type of tourist stay whose main interest is the discovery of vineyards and wine production methods. It is a subcategory of agritourism which consists in discovering farmers. Wine tourism allows winegrowers to present their work in a new and more intimate way. During this type of trip, tourists can stroll through the vineyards, visit the wine cellars and in general the producer offers a tasting of his range. Wine tourism is appreciated both by connoisseurs who can ask very specific questions directly to producers, and by the laymen who can be trained in the art of tasting thanks to the advice of the winegrower, a sommelier, an oenologist or professional guides who lead the visit. While visiting the vineyards and the winemaking cellar is a must, the activities offered to travellers are becoming more and more numerous.